Accessibility is a key aspect of living in one’s home and being able to enjoy it. It is one of the major precepts of creating and experiencing effective living spaces – along with safety, comfort, and convenience. However, there are multiple layers to the concept of accessibility. There is a familiar meaning, and there are other considerations that give it considerable importance in home design and aging in place. If we were to ask most people about accessibility as it relates to homes people live in, they most likely would respond that it has something to do with people entering their home without any significant challenges. That is true, but this is a very narrow interpretation of accessibility. To broaden the concept, it means being able to navigate a home regardless of any physical challenges that someone might have, such as using crutches, a cane, walker, or wheelchair. This would apply to occupants of the dwelling as well as anyone else who entered the home – invited in advance or just appearing. Navigating the home further means being able to easily get through any doorway in the home and to get across any flooring surface without any challenges such as those created by uneven, loose, or variable height surfaces. Accessibility means being able to use all aspects of a home, regardless of someone’s level of ability. This includes door handles, doorways, mirrors, appliances, thermostats, wall switches and controls, bathroom fixtures, outlets, furniture, and closets. Actually, everything in the home is included, whether part of the home as something installed or built into the design or whether it is an accessory, furnishing, or something else added by the occupants. A home is not totally usable, enjoyable, or functional unless the people living in the structure plus anyone coming into the space can easily use any aspect of the home. This is what truly makes it accessible. Aside from the obvious of what constitutes accessibility – getting to and through a doorway – a significant challenge for people when it comes to accessibility is found in the kitchen. Opening drawers and cabinets is part of overall accessibility in the home. For people with physical limitations that might limit their ability to stand, their reach, their range of motion, or their hand or arm strength, their home needs special considerations for it to be accessible. Moreover, addressing such accessibility should not be limited to homes where people have hand, joint, or muscle concerns in their hands or arms. Balance and low vision also affect such accessibility. When it comes to grasping, grabbing, using, controlling, holding onto, or pulling a drawer pull or a door handle, people need to be able to do this regardless of their ability. We can address these concerns when we learn about them as we perform specific aging in place modifications. However, we can include them in any design we do as part of a universal design emphasis we offer to make sure that such limitations do not affect the client in question. Trying to grab a small round or square drawer pull requires the ability to close one’s fingers around the handle and grip it, enough hand and arm strength to be able to pull the drawer open using just this single knob, and enough vision to see where the knob is located so it can be engaged. There are styles of drawer pulls and cabinet handles that allow the user to get their fingers inside the piece of hardware, as in a cup or “D” handle or a bar that extends a short distance away from the surface. The main thing to remember with such designs is that people still must have enough strength to control them and that there needs to be sufficient space for their fingers to be in contact with the hardware without risking injury or discomfort in using them. 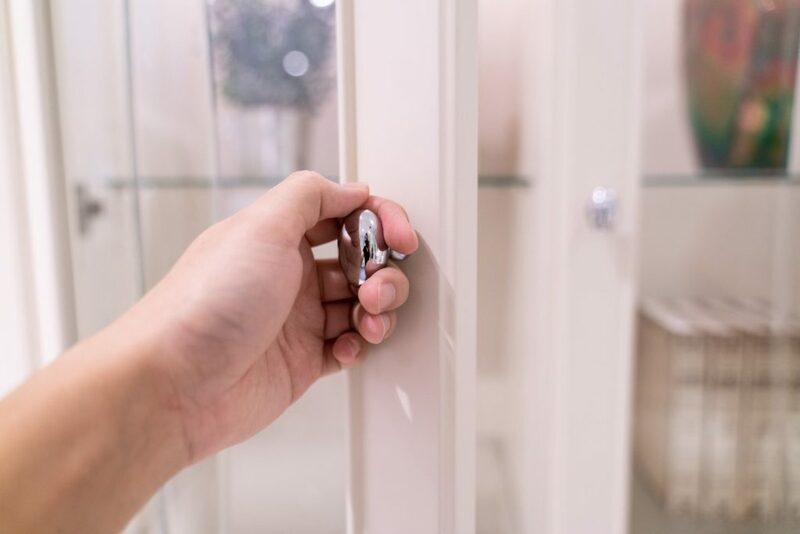 Generally, the more someone can use their forearms, upper arms, and shoulders to help them control and open drawers and doors – rather than just their fingers – the more comfortable it is going to be and the more successful they will be in opening what they need. Another consideration with drawer and door pulls and handles is the bar that has an extension on either side of the mounting posts. We’ve all seen these. It doesn’t matter whether it’s a one-inch extension or one that is longer. The point is that this can catch loose clothing, a belt loop, a pocket, or an apron string and cause a person to be restrained – potentially causing them to understand what has happened, to lose their balance, or to drop or spill something on themselves. Accessibility is a far larger issue than just entering and using a space. It deals with how we use items in the home and how easy they are to be engaged.